UEHS Mock Senate members recently traveled to Albany to visit the New York State Capitol. For some students it was their first time to the Empire State Plaza. Students toured the New York State Museum where the highlight of the day was riding the carousel, something that is very familiar when living in the Southern Tier. 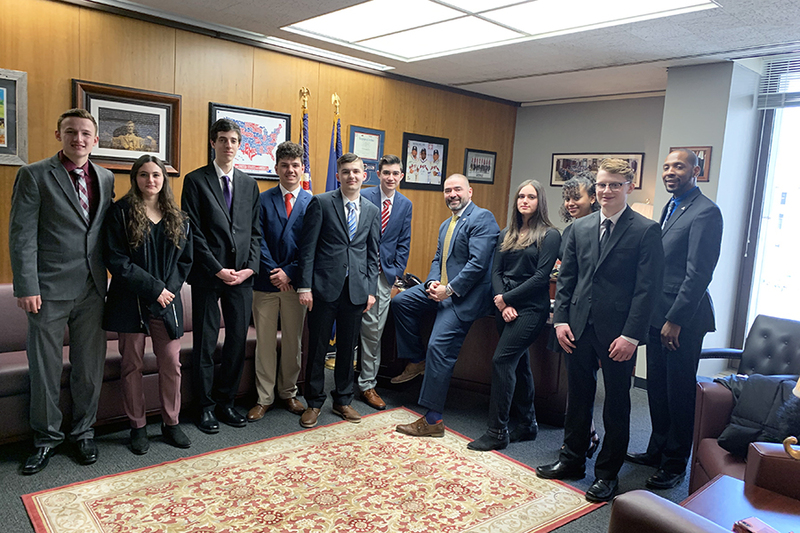 Our student “senators” met with Senator Fred Akshar and Assemblywoman Donna Lupardo. There was much discussion about the construction going on around UEHS, the future of the Oakdale Mall, and the possibility of bringing future businesses to the area. Students were introduced in the assembly chambers and then watched both the assembly and senate sessions. The purpose of the trip was for student “senators” to see the similarities between the mock session they held back in January and the actual sessions of the assembly and senate. Our student “senators” would like to thank Senator Akshar and Assemblywoman Lupardo for meeting with them and for their continued support.